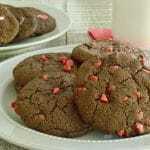 Chewy Chocolate Cookies with deep decadent flavor, chewy on the inside with a slight crispy edge. Great for Gift Exchanges or neighbor gifts because you can make them up in no time! Today’s Chewy Chocolate Cookie recipe is a part of #choctoberfest2017! Over 70+ food bloggers are posting over 200+ chocolate recipes all week long. You can link to the ones posted today at the links in the bottom of the post! 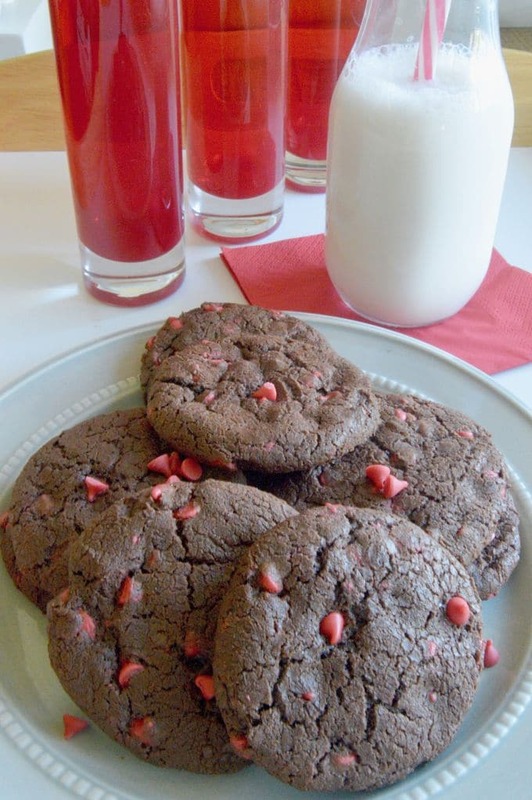 This Chewy Chocolate Cookies recipe is sponsored by Imperial Sugar. All opinions in using their product are my own. Their motto is “Since 1843, Imperial Sugar has been at the heart of family traditions and celebrations. 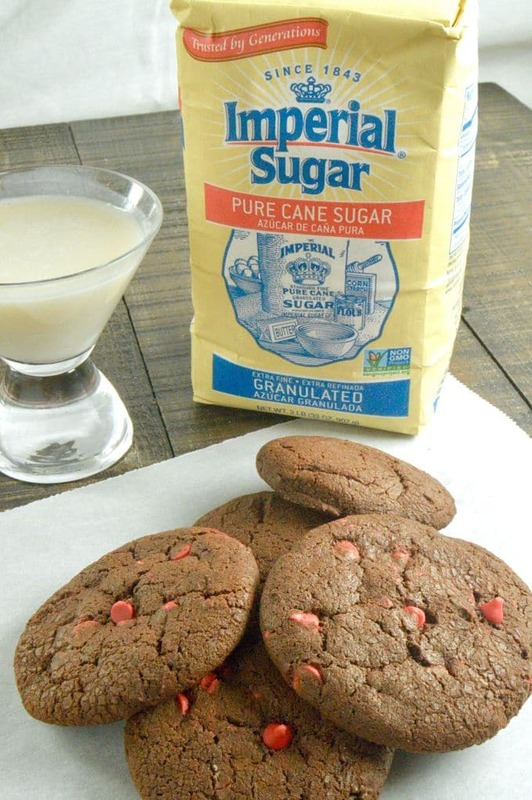 This holiday season, create some lifelong memories when you bake with love and Imperial Sugar.” I must say, these are sweet delicious cookies! To enter the giveaway you can enter here on my post announcing the #choctober details here! Okay, now down to this over the top chewy chocolate cookies recipe! I like this recipe because they are so chewy, but they have deep chocolate flavor too! The recipe makes a small amount so you don’t feel like you have to spend all day in the kitchen making them but still get to enjoy them! (Don’t worry, the recipe is easily doubled/trippled with no variation to get more if you want to make them for a gift for your neighbors or a Christmas Cookie exchange. Here is a graphic showing how the cookies should look at each step. They are really quite easy to make. There is a wait time to let them chill for at least an hour, but other than that they are very quick to make. Mix the sugars and the butter first. This is what the batter will look like when it is completely mixed. (Use your beater attachment for best results. Be sure and beat your eggs before adding them to the sugar/butter batter. By doing that the texture of your batter will be even and somewhat loose as pictured. Once the flour mix had been added the dough stiffens up a bit. You have free reign to add what ever mix in you like. I used cherry chips in one batch and peppermint chips in another. You will need to stir them in by hand, they don’t break as much an you get better distribution this way. You’ll then form a log with them to be chilled. Yes your hands will get a little messy! But I won’t tell if you sample what is on your hands to taste test if you won’t! You will cut the log into even slices so all the the cookies are of equal sizes. The last steps are to roll them into a ball then and slightly flatten them before baking! Are you looking for other Christmas cookie exchange ideas? Check out these Tropical Christmas Cookies or these million calorie bars. I promise you won’t be disappointed! In a separate bowl use a fork to beat egg well. Then add to butter/sugar mix and blend well. Sift together flour, baking powder, cocoa and salt in a separate bowl. In 3 sections slowly add flour mix to butter mixture incorporating completely before adding the next section. Once the dough is completely mixed together, remove bowl from mixer stand and grab a wooden spoon/spatula. 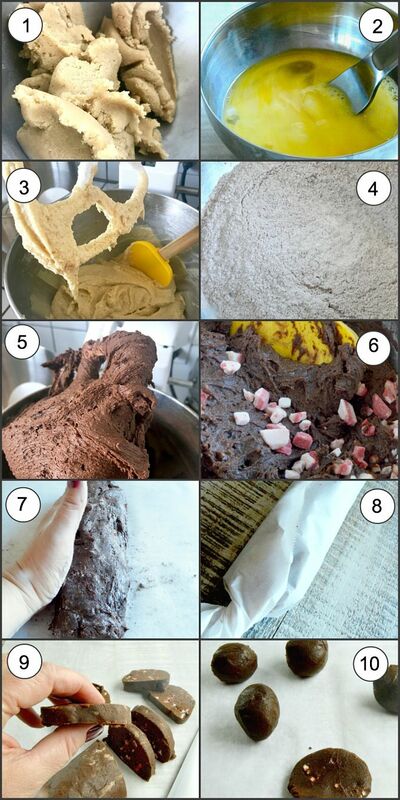 Slowly mix in your add in topping by hand to evenly distribute toppings through out the dough. Remove log from fridge and cut into 16 slices. Take each slice and form into a ball, place on a parchment paper lined cookie sheet and place 2 inches apart. Using the palm of your hand slightly press to flatten. Bake for 10 - 12 minutes, turning the cookie sheet at 5 minutes to get even baking. Allow to cool on cookie rack for 15 minutes minimum. Once cooled, store in airtight container. You’re the best neighbor for giving these to us! They were so good!